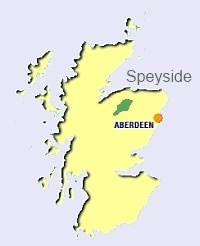 The Undiscovered Speyside Site is being managed, updated and promoted by the Speyside Area Forum. Click HERE to email the Speyside Forum. Originating in the Highlands from Loch Spey and at 107 miles in length, the Spey is the second longest and the fastest-flowing river in Scotland. Speyside is a wonderfully diverse area to explore on foot, bike or by car. Throughout Speyside, you can be assured of a true Highland welcome. Speyside is the mecca for whisky aficianados and can boast it is home to almost fifty distilleries and, according to those in the know, that's more than half of ALL of the distilleries in the whole of Scotland (estimated to be over 85 working distilleries). Malt Whisky produced in Speyside can be found in the top ten best selling whiskies all over the world. Many of the whiskies made in Speyside are the backbone of most of the well known blended whiskies including Chivas Regal, Johnny Walker and Clan Campbell. There are more than fifteen distilleries with visitor centres for you to explore and many more open their doors just for the Spirit of Speyside Whisky Festival. Walking in Speyside is very varied, from flat, level routes to almost extreme hill walking and is very rewarding with stunning views and vistas around every bend. Speyside is also home to Ben Rinnes and at 840m can afford views of nine counties on a clear day. The Speyside Way is one of four official Long Distance Routes in Scotland, first opened in 1981 and runs for a distance of 60 miles following the valley of the River Spey for much of the way. There are also many smaller, local walks throughout Speyside taking in some of our villages and towns. The Glenlivet Estate has high hills and sheltered glens with many different trails and tracks for you to explore, again with stunning views around every bend. A large proportion of Speyside is completely wild and provides home to a vast variety of wildlife which cannot be found anywhere else in Britain, ranging from Red Squirrels, Ptarmigan and Pine Martens to the elusive and endangered Scottish Wildcat. Buzzards, Sparrowhawks and Kestrels are ever present and sometimes a Peregrine Falcon, a Merlin or even a spectacular Golden Eagle can be seen soaring in the skies around Speyside. There are many migratory birds that make their home in Speyside including Oystercatchers, Curlews, yellow wagtails, cuckoos, swifts so if you are looking for some of the best bird watching opportunities, you need look no further than Speyside.